Del Pepper was born and raised in Omaha Nebraska. She received her Bachelor’s degree from Grinnell College and did graduate work at the University of Wisconsin. She worked five years as a social worker in Chicago, Illinois. She is married to Dr. F. J. Pepper, a practicing psychiatrist with an office in Alexandria. The Peppers moved to Alexandria in 1968 and have been active in the city ever since. They have a married son, Murphy Pepper. He and his wife Soo have five children. Del Pepper chairs the City's Facilities Naming Committee and represents the Council on the Alexandria Commission on Aging. She co-chairs the Alexandria Works! Coalition and the Eco-City Alexandria Environmental Action Plan Steering Committee. Del represents the City Council on several regional committees. 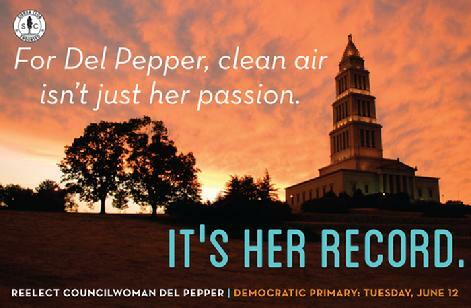 Del is a former President of the Metropolitan Washington Council of Governments (COG) Corporation, and currently serves as the Mayor's alternate to the COG Board. Del represents the City Council on COG's Air Quality Committee (MWAQC), where she earlier served as the chair and presently serves as the vice chair. She serves as the Council's representative on COG's Climate, Energy and Environment Policy Committee, (CEEPC). Pepper represents the Council on Northern Virginia Regional Commission, where she earlier served as the Treasurer and as chair of its Operations Committee.